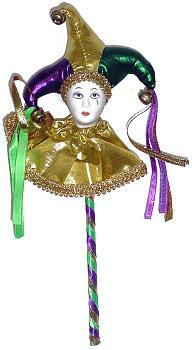 A mardi gras jester doll on a stick. The doll wears a metallic purple, green & gold jester hat with bells on it, which has ribbons hanging from either side. The stick is wrapped in purple, green & gold ribbon. The doll is approximately 5" long, 10" long with the stick. The widest part of the doll, the hat, is approximately 4" wide.